" A peaceful haven. Oh, what a garden! Thank you. " "Wonderful hospitality. Can we move in? " "Thank you for a lovely stay. A real home from home." Stylehurst Farm at Capel, near Dorking, is a small working farm set in the beautiful Surrey countryside. The house was converted from the old farm buildings in 2002. This conversion has been carried out to a very high specification to provide comfortable and welcoming bed and breakfast accommodation. 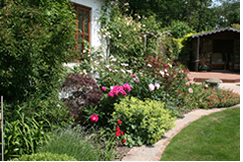 There is an attractive garden and the house is set in 120 acres of farmland. 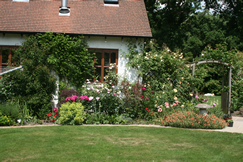 The farm is situated between the villages of Ockley and Capel in a rural setting on a quiet country lane. We are located 6 miles south of Dorking and 6 miles north of Horsham near to the Surrey/West Sussex border. We are also within easy reach of London, Gatwick Airport and the south coast. Stylehurst Farm is surrounded by beautiful countryside, including the North and South Downs, Leith Hill and Box Hill. There are many excellent walks to suit all tastes within easy reach. There are several National Trust properties in the area such as Polesden Lacey, Hatchlands Park and Nymans Garden. Also nearby is the attractive market town of Dorking famous for its street of antique shops and Denbies vineyard, the largest in the south east of England. 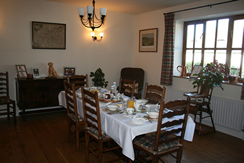 A choice of full English or continental breakfast is served in the morning, along with a variety of cereals, fruit and yoghurt. There are several good local pubs where you can enjoy lunch or an evening meal. Dorking and Horsham have a wide variety of restaurants to suit all tastes. You are welcome to leave your car (at your own risk) if going on holiday from Gatwick Airport. A warm welcome awaits you when you come to stay at Stylehurst Farm. BOOKINGS: If you wish to book at Stylehurst Farm please give me a call as I do not use an online booking system because I prefer to give a personal service. Full details on the Contact Us page. Thank you.